In 1984, the Corolla moved to the format pioneered by the Hillman Avenger: front wheel drive with a transversely mounted four-cylinder engine, and MacPherson struts up front and coil springs in back (the SR5 Coupe and hatchback and the station wagon would be converted later). A small number of diesels were sold in the US, but these were quickly cancelled; and a new version of the 1.6 liter engine, boasting dual overhead cams and four valves per cylinder, was added in mid-1984 to the rear wheel drive coupe and liftback, creating the Corolla GT-S. The fun to drive GT-S attracted a following; and the engine was used in the original MR2, introduced in 1985. Meanwhile, the standard Corolla was rated as one of the ten most trouble-free cars in America by J.D. Power. With sales of its popular new front-wheel-drive Corolla rapidly rising in the United States, Toyota entered a joint venture with General Motors to create NUMMI, taking over a poorly performing General Motors plant in California and turned it into one of the highest quality plants in North America, at least partly due to an innovative system of implementing employee suggestions. The NUMMI plant built both the Corolla and the General Motors version, the Nova (later to be renamed Prizm), and remained active through to the present day. 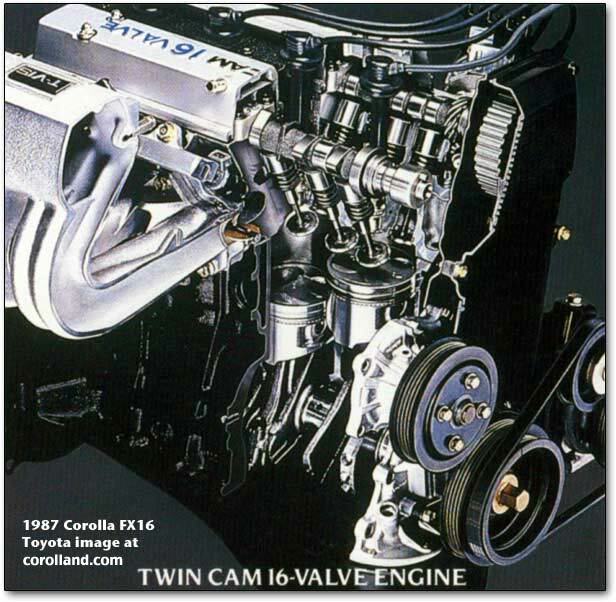 In 1987, the last year of the fifth generation, the two Corolla choices (four door sedan or four-door hatchback) were supplemented by the new sporty Corolla FX Coupe; standard Corollas now came with the 1.6 liter engine, with a generous two-barrel carburetor, standard, as the only engine choice. Corolla trim lines (except FX) for this year were Deluxe (with reclining bucket seats, thick pile carpeting, tinted windows, map pockets, and rear window defogger) and the lower LE (with cloth trim, center console, four-speaker FM stereo, and intermittent wipers). Toyota could boast of some of the lowest maintenance requirements in the industry, with oil and filter changes at 10,000 miles and spark plugs lasting 30,000 miles, with coolant renewal at 60,000 miles, due to intelligent, efficient design, electronic-feedback carburetion, fuel preheating, and other features. 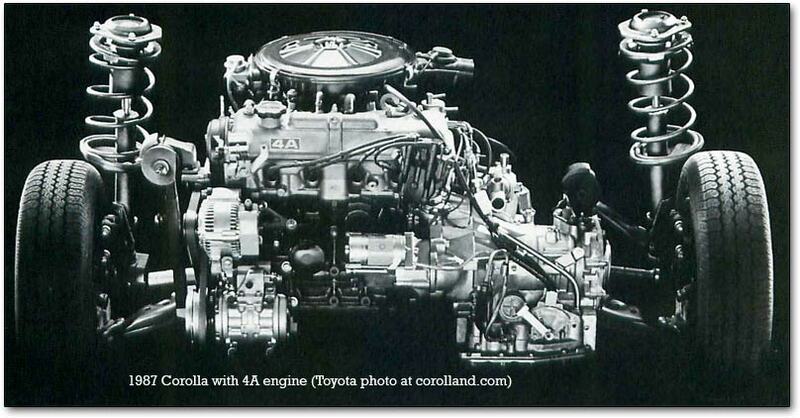 The engine V-belts, according to Toyota, required no service under normal conditions. The Corolla Sport was considered a seperate model, with two versions: SR5 and GT-S. They provided buyers with a sporty appearance and multi-valve engines; the main buyers were female college graduates in their late twenties (except GT-S hatchback, which was single college-educated men, median age 28). 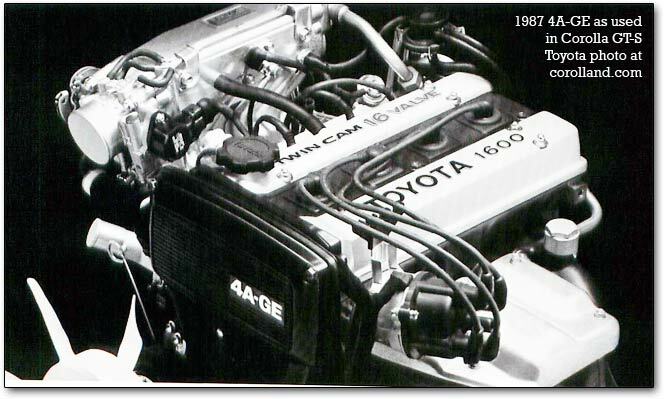 SR5 and GT-S both came as coupes, and GT-S was also available as a hatchback; the SR-5 used the standard Corolla engine, while the GT-S used a higher-compression (9.4:1 rather than 9.0:1), electronically fuel injected, 16-valve powerplant with 112 horsepower and 97 lb-feet of torque. This latter engine used dual cams, a central spark plug (“semi-hemi”), and variable induction - a series of valves in the induction ports to improve intake velocity at low engine speed, andincrease airflow at higher speeds. An oil cooler was standard. Transmissions were the close-ratio five-speed stick and the four-speed automatic. Both had front seats with adjustable headrest angle, fore-and-aft travel, seat cushion height, and lumbar support; analog speedometer and tachometer readouts; optional dual-stage air conditioning (with an economy setting); and standard power steering. 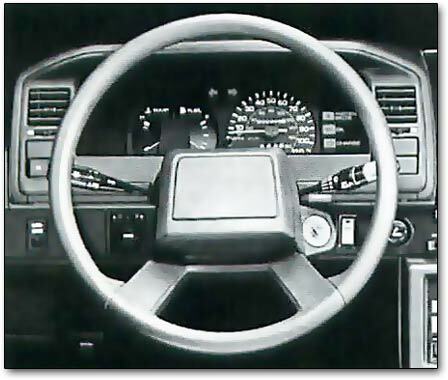 The GT-S had an 8,000 rpm speedometer and a 150 mph speedometer; both had flip-up halogen headlights. Front and rear antisway bars were standard, with an optional antislip differential; GT-S got four-wheel disc brakes, stiffer springs, firmer dampening, low-pressure shocks, and larger diameter antisway bars, as well as 195/60SR13 radials (the SR5 got 185/70SR13 radials). Finally, the FX-16 was started as its own model, complete with the 16-valve 4A-GE engine. There were just two models, both two-door hatchbacks, called FX16 and FX16 GT-S; the base included reclining bucket seats, cloth interior, carpet, folding split rear seat backs, console, full instrumentation, and rear deck cover, while the GT-S added a more aggressive suspension, larger tires and rear sway bar, power remote outside mirrors, leather-wrapped wheel and shifter, tilt wheel, intermittent wipers, and rear window wiper-washer, along with a rear roof spoiler and other cosmetic touches. Both came with Eagle GT tires, either a five-speed stick or four-speed manual, four-wheel disc brakes, and the 16 valve engine, but tuned to 108 hp and 96 lb-ft rather than 112 and 97. That was a good-sized engine for a car that weighed in at just 2,350 pounds (five-speed FX16) or, at most, 2,436 pounds (automatic GT-S). The sixth generation started in 1988. With sales still rising, Toyota opened a new facility in Canada which also produced Corollas. The quality of Toyota's new plants in North America was high enough to garner top (for its class) J.D. Power ratings in 1988, 1990, and 1992, and top ten ratings through 1994. The FX was available with either a single or dual cam engine (with the latter, it was called the FX16). 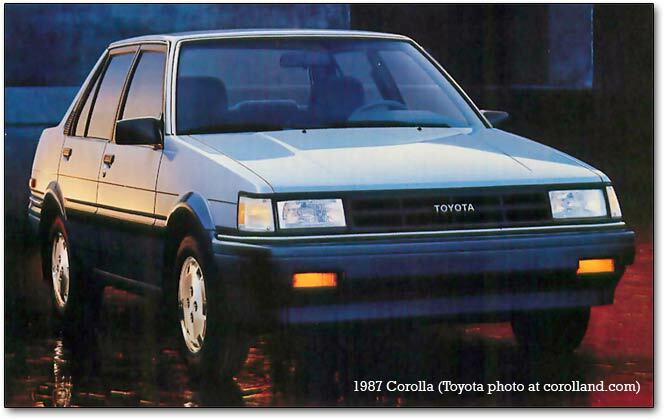 In 1993, the Corolla moved to its current compact size, garnering many awards. The Tercel was split off as a separate subcompact model to attract those who could no longer afford the increasingly upscale Corolla. The 1.6 liter 4A-F engine continued as standard equipment, with an optional stroked 1.8 liter version, the 7A-FE. A driver's side airbag was standard, and a passenger airbag was added in 1994. We expect to host a separate page on this landmark model soon. Also see technical details and drawings of the 1993-1997 models! By 1997, all Corollas sold in the United States were built in North America — at NUMMI and in Canada. The wagon was discontinued, but side-impact protection was increased. In 1998, a new generation was launched, which would last nearly ten years. Its distinguishing feature was a new ZZ-series 1.8 liter engine which produced about 120 hp, with (unlike Civic engines) torque to match. Yet, it achieved very good gas mileage and was quite quiet. This Corolla was critically acclaimed for having a luxuriously quiet interior, high levels of comfort, well designed switchgear and controls, and a responsive yet economical engine. In 2000, the engine was given variable valve timing for better gas mileage and more power. It also reduced emissions, so that the Corolla could be certified by the EPA as a low emission vehicle. 2001 saw a minor facelift of the sheet metal, making the Corolla look even more like a Camry. In 2003, the Corolla was expanded and cosmetically modified in a periodic redesign, while in 2004, a new generation was introduced that was larger inside - nearly matching the prior-generation Camry. In 2005, the Celica's engine was retuned for better mid-range torque (and lower horsepower) and put into a modified Corolla to produce the Corolla XRS. The 2009 Corolla saw numerous cost-cutting moves, some of which detracted from the car’s feel; a new engine with roughly the same power was used. 2009 Corolla details.